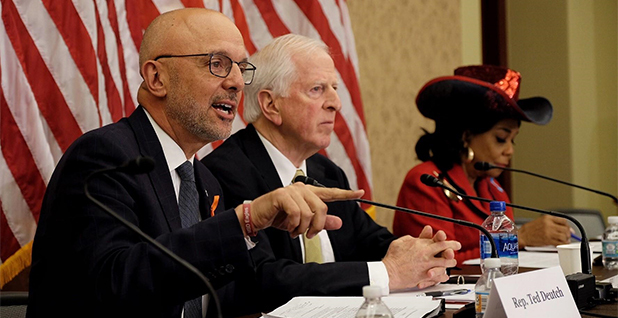 A co-chair of the Climate Solutions Caucus, Rep. Ted Deutch (D-Fla.), is the lead sponsor of the bill, joined by Reps. Francis Rooney (R-Fla.), John Delaney (D-Md. 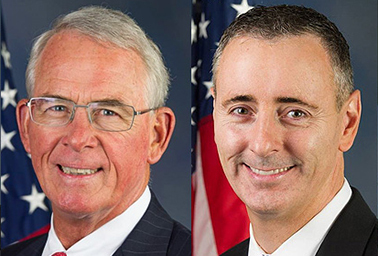 ), Brian Fitzpatrick (R-Pa.) and Charlie Crist (D-Fla.). The bill isn't likely to pass in this Congress, but the co-sponsors say it would reduce U.S. carbon emissions by a third in only a decade and 90 percent by 2050, all compared with 2015 levels. "I'd like to stress how significant this legislation is," Deutch said last night on a call with reporters, which was abbreviated due to technical difficulties. He pointed to sea-level rise, stronger storms and shortened winter seasons affecting communities across the country. "That is not some dystopian science fiction novel," Deutch said. "Those are the facts of climate change we are facing today." The bill is the product of years of groundwork laid by the Citizens' Climate Lobby, the group behind the bipartisan Solutions Caucus. It closely mirrors its long-standing fee and dividend proposal, but it's garnered rhetorical support from other carbon tax advocates, including the Alliance for Market Solutions and Climate Leadership Council, which pushes the Baker-Shultz carbon dividend proposal. "This is a big deal," AMS Executive Director Alex Flint said in a statement. "The week after the Administration tried to downplay its own stark climate report, responsible policymakers, including Republicans, are proposing legislation to address climate change." The Trump administration last week released a congressionally mandated report warning of stark economic and social consequences across American society if emissions aren't curbed (Climatewire, Nov. 26). The final version of the bill would exempt agricultural fuels and nix certain EPA greenhouse gas regulations for stationary sources, though it would leave vehicle fuel efficiency standards and methane regulations in place. It would also restore regulatory authority if cumulative emissions targets aren't met after 10 years. The regulatory provisions have been a sticking point for conservative climate advocates, who see regulations as duplicative with a carbon pricing structure. However, the bill would not eliminate tort liability for greenhouse gas emitters. That's a feature of the Baker-Shultz proposal that has been widely criticized by environmental groups, which see it as an out for polluters. As with other carbon tax bills, the "Energy Innovation and Carbon Dividend Act" includes a border carbon fee adjustment. Imported carbon products would be hit with a tariff if the country of origin does not price carbon, while exports would get a refund. The bill's sponsors say it would incentivize other countries to price carbon. The measure joins several other carbon tax proposals floating around Congress. Florida Republican Rep. Carlos Curbelo rolled out his own carbon pricing measure this summer, while Sen. Sheldon Whitehouse (D-R.I.) and other Democrats have their own proposal. Sen. Chris Van Hollen (D-Md.) and Rep. Don Beyer (D-Va.) have also introduced a cap and dividend measure. But the Deutch-led bill is among the most ambitious carbon pricing proposals, at least in the near term, according to an analysis authored by Noah Kaufman, a researcher at the Center on Global Energy Policy at Columbia University's School of International and Public Affairs. "By 2030, carbon tax rates under the Deutch proposal would be at least 60 percent higher than under the Whitehouse and Baker proposals and at least two times higher than under the Curbelo proposal," Kaufman wrote. Deutch acknowledged that his bill alone likely would not be enough to combat climate change. "This bill won't solve all of our problems," he said. "We're not naive to think that it would, and starting on day one of the 116th Congress, we look forward to working with Democrats and Republicans alike to consider other parts of the climate change challenge." Kaufman said a fuller analysis will be needed to look at the full economic effect of the bill. But he said there is no question the bill would be a serious attempt to combat climate change. "You can't look at this bill and say it's just greenwashing," Kaufman said.